Michal first appears in 1 Sam. 18:20 where we learn that she loves David. Not only was she the only woman in the Bible we are told loved a man but it seems that she also publicly declared her romantic interest in David. Even her father, King Saul, knew of her affections. Being mentally unstable, Saul found the giant-killing upstart a threat to his kingship. Saul promised David his daughter Michal’s hand in marriage if David could slay 100 nasty Philistines and bring back their foreskins. Saul thought that Israel’s enemies would kill David and rid him of the beautiful young warrior. When David delivered not just 100 bloody foreskins but 200, the King Saul had no choice but to deliver on his promise. After the marriage, Saul was still determined to eliminate his rival. He attempted to kill David but the quick-thinking Michal helped her husband escape out a window. She then used teraphim (household idols) to make the bed look like David was sleeping under the covers. A majority of commentators blame Michal for her later tragedies due to her possession of the carved images. They seem to overlook the fact that she lives in David’s house and therefore the idols might be his (Exum, Murder They Wrote, p.126). Significantly, Michal is in charge in this story. Commentators then criticize her for destroying their chances for emotional intimacy because she did not follow David into the battlefield! On the run, David delivers his parents to a safe place, gathers his brothers “[a]nd every one that was in distress, and everyone that was in debt, and everyone that was discontented, gathered themselves unto him.” But not the distressed wife who might have been in danger when her father discovered her role in David’s escape. King Saul threw a javelin at his son Jonathan when he found out he had been assisting David (1 Sam. 20:33) so it is reasonable to think that Michal feared for her life. Over the next few years Michal’s brother, Jonathan, met secretly with David, but David didn’t appear to make any effort to contact his wife; in fact he went on a wife-acquiring spree. 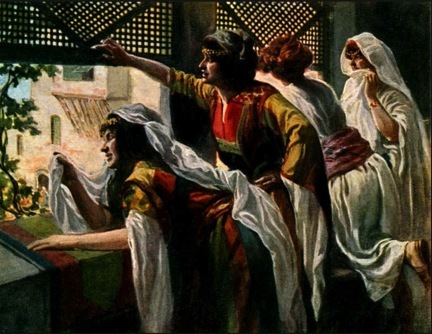 When his new brides, Abigail and Ahinoam were captured by the Amalekites, he quickly came to their rescue. One begins to wonder if he didn’t like being saved by a woman and for that reason he ignored Michal. Meanwhile, King Saul gave his daughter away to another man. After all that Michal had been through, it seems much more likely that she saw the man she loved (or did love) flaunting himself as sexually available while making it abundantly clear that he had neglected her. In response to her criticism he stated, “I’m not doing anything wrong. I’m dancing before the Lord.” Meanwhile, he makes sure all the young girls get a good look at his genitalia. Contrary to many exegesis, I do not think that Michal receded into passivity allowing her father and her husband to control her. I see her outcry as a form of protest, a public denouncement of her oppression. “The futility of protest… does not deter Michal, who thereby lays claim to her own voice.” (Exum, Fragmented Women, p.28) She did not lose her sense of identity becoming “shrunken in stature and depleted in spirit.” She is fearless and independent. Then David cursed Michal and thereby tried to silence her. The text states, as if it were a consequence of David’s words, that Michal was barren until the day of her death. Of course it could have been her decision to not have sexual relations with David, thereby denying David any claim to the royal lineage of Saul. Later rabbinical commentators also rejected the notion that there was something deficient in Michal. They credited her with biblical scholarship and with the use of phylacteries just as men do in prayer (see Louis Ginzberg, The Legends of the Jews, vol. 1, p. 274). In fact, later Jewish fathers who wanted their daughters to learn cited Michal as a precedent for women having an equal share in education. Today by retelling Michal’s story, appreciating her strength of character, we right an ancient wrong and allow her to keep speaking. There is so much more to Michal’s story but I will have to save further examination of this literary masterpiece for another time. Clines, David J.A. – “Michal Observed: An Introduction to Reading Her Story.” in Telling Queen Michal’s Story: An Experiment in Comparative Interpretation. David J. A. Clines and Eskenazi, Tamara C., eds., Journal for the Study of the Old Testament: Supplement Series 119 (Sheffield, Eng. : JSOT Press, 1991) 24-63. Exum, J. Cheryl – “Murder they wrote. Ideology and the Manipulation of Female Presence in Biblical Narrative” in Alice Bach, ed., The Pleasure of Her Text: Feminist Readings of Biblical and Historical Texts (Philadelphia: Trinity Press International, 1990) 45-67. Hammond, Gerald – “Michal, Tamar, Abigail and What Bathsheba Said: Notes Towards a Really Inclusive Translation of the Bible” in George J. Brooke, ed., Women in the Biblical Tradition (Lewiston, N.Y.: Mellen, 1992) 53-70.